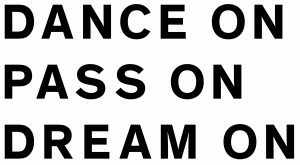 Podpora/Supported by: Program Kreativna Evropa v okviru DANCE ON PASS ON DREAM ON./ Creative Europe Program of the European Union as part of DANCE ON PASS ON DREAM ON. Gisela Müller has been the head of pedagogic programmes in the Berlin dance centre Tanzfabrik since 2004. She started her dance career at a time when the experimental practices of American post-modern dance started to spread and mix with the new European choreographic impulses of the 1980s and when various dance practices and techniques were submitted to explicit hybridisations. This exciting period of new aesthetic and pedagogic dance movements, which combined with an exceptionally inspiring European dance production of the 1980s, were formative for the dancer Gisela Müller, who is returning to the stage after two decades of pedagogical work. She studied dance in Paris, finished her studies at the School for The New Dance Development in Amsterdam and in the end of the 1980s spent a relatively long period in various dance studios and educational programmes in New York. She danced with a number of dance ensembles in both USA and Europe, and in 1992 she established her own ensemble The Move Company for which she created a series of choreographies. Between 2006 and 2010 Gisela Müller was a guest lecturer at the Interuniversity dance programme HZT Berlin, where she created and led the first level of the academic programme for contemporary dance, its contextualisation and choreography. She is also a member of the decision-making body in the Balkan dance network Nomad Dance Academy. It was only a question of time when Gisela Müller would once again decide to continue her choreographic work, even though the performance Me again – But not Alone does not give the impression that her work as an artist ever ceased, but that it is the result of a long and extensive research of potent crossing points between dance, radio and sound art. She invited Andi and Hannes Teichman (Gebrüder Teichmann), electronic musicians, DJs and activists on the Berlin techno underground and culture scene who swear by the motto: Do it yourself! to collaborate with her. The creators planned the performance around the ways in which the aforementioned media use the space, on the material sources of movements that are characteristic of them (sound and body), the importance of certain locations and on their complementariness. The use of space and body enables them to use various technologies to mark the sites where the materials were found and gradually transform them into an object of art, in which the choreographic and sound media are no longer separable. With this the performance Me again – But not Alone reaches beyond the composition, into the field of interdisciplinary artistic construction. The artist and theoretician Anna Friz understands radiophonic subjectivity as partial, conditioned by echo and enacted in the aggregate of the body and electronics. Recording and portable (broadcasting) technologies enable the voices to be heard far from their place of origin, however they should not be thought of as separated from their bodily sources. The transfer of sound enables an insight into the immanence of the imprint, the uniqueness and non-interchangeability that a specific body created. The title of the performance Me again – But not Alone can also be understood as expressed by a personified choreography, which sees itself in the data of the carrier: in the sound picture. The mobility of the radio or sound body can be similarly informative for the composer of the performance. 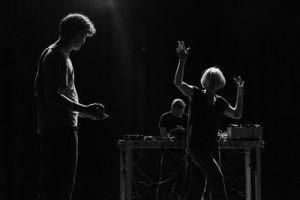 The performance thus gives us a unique insight into the various ways of listening to a picture (a moving body on stage) and watching sound (which the sound artists create and process) which relaxes our receptive instrument in a specific way.